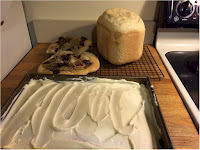 So today's cooking was a little bit more binge-like, though I was baking for a family member recovering from surgery and others who were coming to visit (me, not him), which is also like purposeful cooking. What you'll care about is what I was listening to, of course. Before getting started, I read Fiction Podcasts Are Finally a Thing! Thank You, Sci-Fi and Horror at Wired. 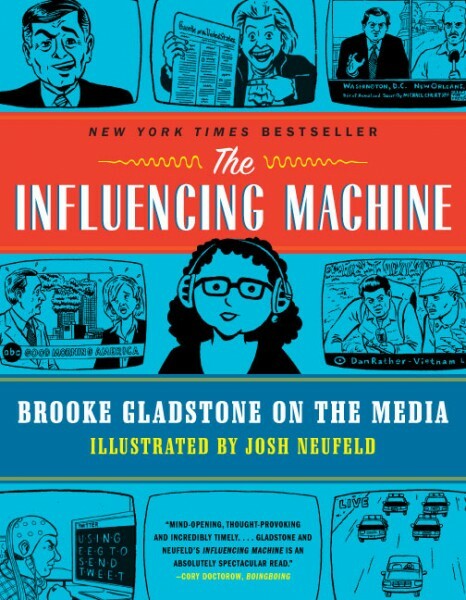 The author points out that nonfiction has monopolized podcasts. But "The past year has seen the rise of fiction podcasts, many of which follow a found-footage horror or sci-fi format." I listened to two podcasts mentioned in the article. Welcome to Night Vale. I listened to Episode 1, which had an old-time radio broadcast vibe. What it didn't have was enough narrative for me. It was a news broadcast of the weird daily events in a town. However, my attention was divided, what with having to oil a shortbread mold and all. So I listened to Episode 2, as well. I still didn't warm to it. Within the Wires. I admire the premise of this podcast series created by the people behind Welcome to Night Vale. What we're listening to is a directed meditation from hell. At the end of Episode 1, it becomes clear that it was created for a patient at a hospital. Again, though, I didn't feel I was hearing a real story. Supposedly, "As listeners move through the relaxation curriculum a deeper and more personal story unravels." But I didn't move on. After that I spent a few moments trying to find a French language YouTube series I stumbled upon several evenings ago and haven't been able to find since. After that, I gave up and listened to music. 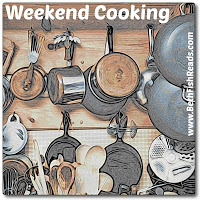 I'm taking part in Weekend Cooking at Beth Fish Reads. 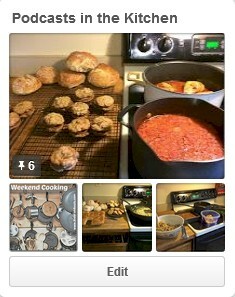 And you can catch up on all my Podcasts in the Kitchen posts through Pinterest. 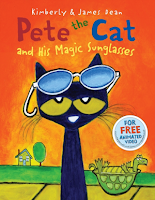 Do Child Readers Need To Understand Cool Cats To Enjoy Pete the Cat? I read a couple more Pete the Cat books. 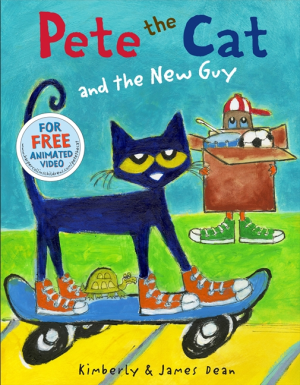 Though I found them a little more instructive than I did the first one ("being different is really very cool" in Pete the Cat and the New Guy), I was struck by something about them. Pete the Cat, he's cool. grade schoolers who will probably read these books get the beatnik references? I don't see how they can. If they don't get the cool cat beatnik joke, why do they like these books? 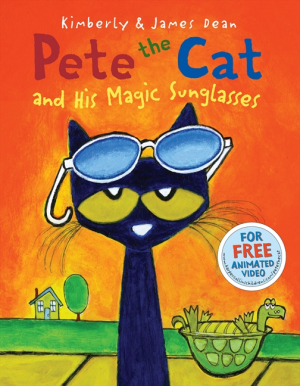 Because anyone can see that Pete the Cat isn't a regular cat. Even by the standards of picture book cats, there's something about this one that makes him unusual. In the world of today's children, cool isn't being different. It's meeting some standard of attractiveness. It's usually about adhering to a group in some way. But Pete is a totally different kind of cool. He's the kind of cool that's too cool to care. He shouldn't exist in the world. That makes for incongruity. And incongruity, my friends, is funny. That's why kids don't need to get the beatnik joke. 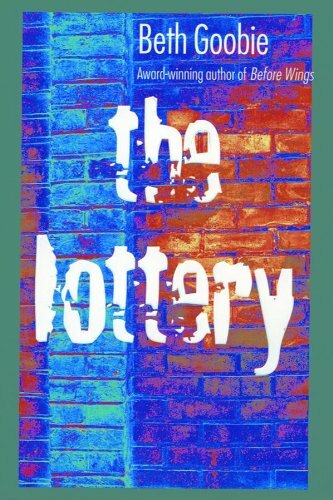 I'm not sure how I found The Lottery by Beth Goobie since it's a fourteen-year-old book. It was one of those situations where I bring home a book from the library, leave it on my library pile for weeks, and when I find it go, "Why, whatever could this be?" Okay, time to remind everyone about my Shirley Jackson obsession. No doubt The Lottery title was the initial draw for me. There definitely is a conection between this Lottery and Jackson's. The basic premise of Goobie's book is that a secret club, the Shadow Council, exists at Saskatoon Collegiate High School. Each year the members, which change as students graduate and move on, select a victim for the year. The victim serves the Council by running errands that primarily involve delivering notes instructing students to do their unsavory bidding. Oh, and the victim is shunned by the rest of the student body for the school year. Then a new victim is selected, and things go back to normal for the old one. In a manner of speaking. Yeah, it sounds pretty far-fetched when I put it that way. But I totally bought into it, just as I, and so many other readers, bought into Jackson's Lottery. One of the fascinating things about both stories--all the townspeople/students had to do was say, "No." All the characters bought in, just as the readers do. They gave the lotteries their power. A little drawback to the Goobie book: It's a problem book, which is fine. Main character Sal is dealing with a significant and interesting problem. But it's not the only problem. Sal has a troubled backstory. There's a character in a wheelchair and another who's autistic. It's a little bit of a pile on. But otherwise this was a good world/reading experience. This was another weekend of cooking during which I didn't feel that I was binging. It was more a matter of "We need dessert." "I'm out of bread." "I want to eat pears in a way that I have never eaten pears before." Then I dragged myself around the kitchen and made this stuff. A binge is a little more ecstatic and less needy. 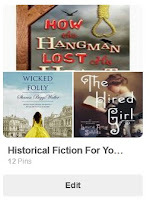 I continued my attempt to find podcasts of people reading a piece of writing instead of people talking about writing. What did I listen to? Zahna by Dorothy Bouzouma at Slice Magazine. This is an essay that Slice nominated for a Pushcart Prize. The author married a man from Mauritania, and her essay is about his family's effort to turn her into a Mauritanian woman during a visit there. The author sounded somewhat down reading Zahna, and I have to say I found myself feeling distressed listening to it. It seemed as if Bouzouma was being taken over, losing herself, to this culture that wasn't her own. I found myself thinking, Is any man worth this? It's a pretty successful essay in that it drew such a strong response from this listener. Then I found No Extra Words, a flash fiction podcast. Over the past two years, I have worked steadily completing and revising a couple of novels. But the only truly new works I've written are two pieces of flash, one fiction and one an essay. I listened to a few pieces at No Extra Words and found them well done. But nothing moved me the way Zahna did. I'll go back to this site and explore some more. so what" (my definition of story) without traditional conflict? 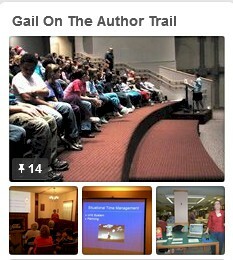 Once again, I'm taking part in the Weekend Cooking meme at Beth Fish Reads. You can also check out all my Podcasts in the Kitchen posts at Pinterest. 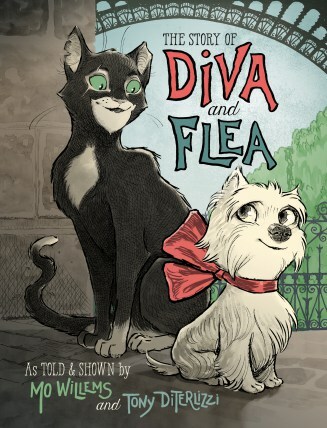 The Story of Diva and Flea by Mo Willems with illustrations by Tony DiTerlizzi is about a French dog with a home and not much sense of adventure and a French cat, Flea, who lives on the street and is very into adventure. And they become friends and have a positive impact on each other, and that's all very meaningful and nice. Here's the reason I'm taken with this book. Diva belongs to a gardienne, Eva, who takes care of a building. Towards the end of the book, we see Eva's feet as she sweeps a floor. I thought, Sacre Bleu! That could be the concierge in The Elegance of the Hedgehog!!! 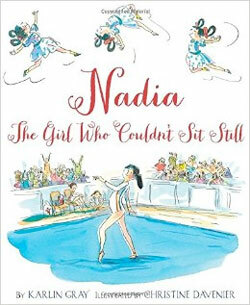 international bestseller from France around eight years ago. It had two main characters, a twelve-year-old girl who lived in an upscale building and Renee, the upscale building's concierge. Renee is quite fantastic, a nobody building maintenance worker who is also a French intellectual. Though no one knows it. Like Diva, she becomes friendly with someone quite different from herself. Or is he? I must say, The Elegance of the Hedgehog includes an event that left some readers shaken. (I'm looking at you Sally Allen.) 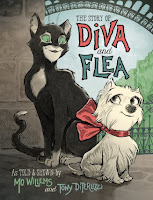 Still The Story of Diva and Flea and The Elegance of the Hedgehog could be companion books. 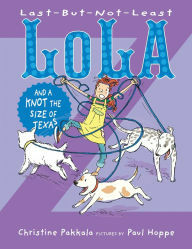 Young readers could read Diva and Flea preparing themselves for the philosophy and shock of Hedgehog. Yes, I recall that Renee was a cat person. But look at the cover of Diva and Flea. Diva is one of those fluffy little dogs that could pass for a cat. 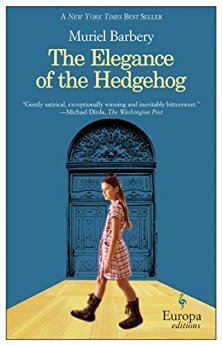 My Goodreads post about Hedgehog from 2012. "Nancy Tandon's SAY MY NAME, in which two speech-therapy 'rejects' draw strength from heavy metal music and Muhammad Ali as they search for their true voices, to Rana DiOrio launching Big Dill Stories, in a nice deal, for publication in Fall 2017 (World)." Nancy is a member of the Society of Children's Book Writers and Illustrators, has attended its programs, and is the moderator for our writers' group, which is sponsored by the New England SCBWI. In addition, she's been a finalist for the Tassy Walden Award. In fact, I believe she's been involved with that award more than once. My point being, she has been training as a writer for a while now. This sale didn't just happen, didn't just drop in her lap. She worked for it. 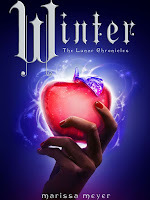 I enjoyed The Lunar Chronicles by Marissa Meyer so much that I bought several of the books for my niece. I even liked Fairest: Levana's Story. And nobody likes Levana. Oh, my gosh! 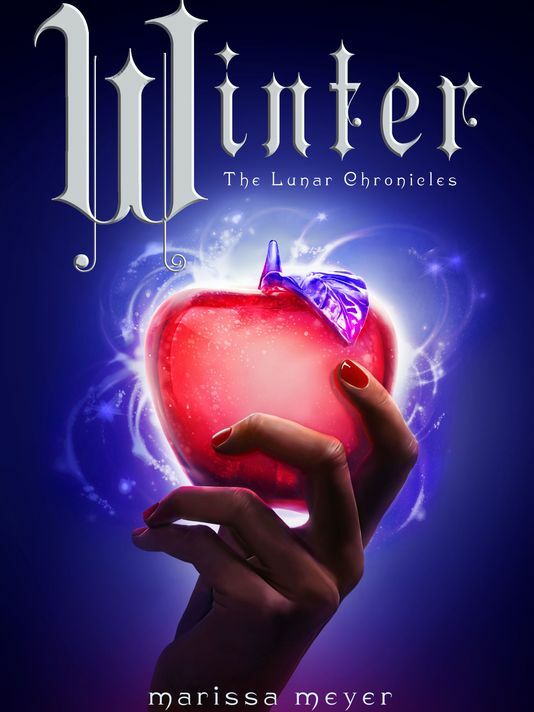 We're not really done with The Lunar Chronicles! Stars Above is a collection of short story prequels to the Lunar Chronicle books. If you are what's known in book collecting and reading circles as a completist, you will probably have trouble resisting that. 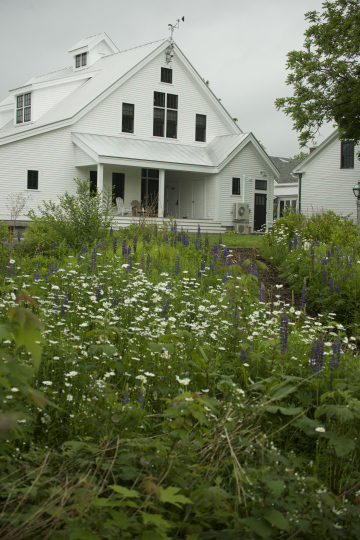 This year's Bread Loaf Writers' Conference starts today. Don't worry. I'm not going to bore you with another story about the great time I had working in the Bread Loaf kitchen back in the day. 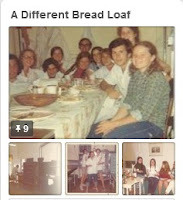 No, I'm going to link you to a Pinterest board collection of all my stories about the great time I had working in the Bread Loaf kitchen back in the day, as well as some never before published pictures. You're not going to see photos like these anywhere else. Anywhere. Goal 1. Adhere to Goals and Objectives. Well...as much as I can when you consider I'm suffering from monkey mind. Additionally, I finally figured out how to use the time tracking app I got a month or so ago. Will it help the monkey mind problem and encourage adhering to goals and objectives? You know I'll be telling you about that at some point. Goal 2. Prepare Mummy Hunters for Submission. This was going to be the just one thing I was going to work on this week. I believe I worked on it once. Goal 3. Generate New Short Work/Programs. I had a nice little nearly finished flash essay on my hard drive that I just needed an ending for so I could submit it to a contest. That became the just one thing I worked on this week. It's been written over and over. Still no ending. Goal 6. Generate New Work: Submitted the picture book to another editor. Began working on my story/essay idea a day project again. I read these three titles before I started my humorous picture book research. What I had in mind while I was reading these was the 3-year-old family member I often read picture books with. My experience reading with him twists my perception of these kinds of stories now. I'm always thinking in terms of what would he like, what would he be able to take in and appreciate? 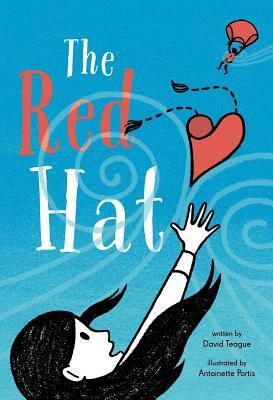 The Red Hat by David Teague with illustrations by Antoinette Portis. 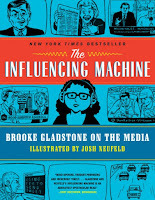 This has striking illustrations in red, white, black, and lots of blue. The story has a little magical realism thing going. The wind keeps two children apart, making one of them work so they can meet. It's a good story, but is it a really young children's story? 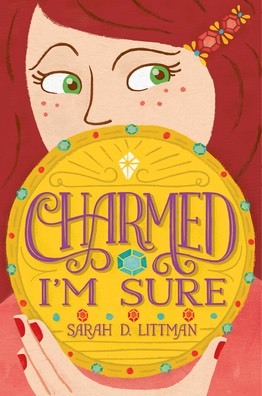 Check out Elizabeth Bird on spot gloss, something I'd never heard of, and its use in this book. Now that I know about the spot gloss in these illustrations, that might be the catch for my young reader, if we were reading this together. I don't know if the story of two kids struggling to meet would grab him on its own. 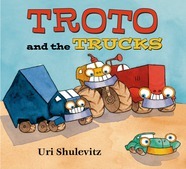 Troto and the Trucks by Uri Shulevitz would be a hit with my picture book reader, simply because of the trucks. And while the story doesn't make a lot of sense to me, the little car overcoming all those trucks might work very well with him. 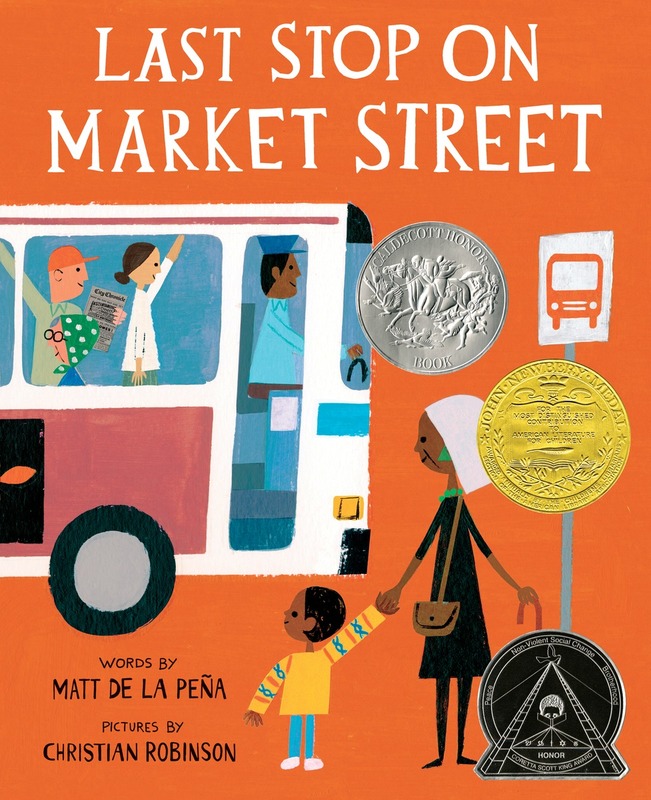 Last Stop on Market Street by Matt de la Pena with illustrations by Christian Robinson. This one I picked up because I read an article about de la Pena that interested me. This is a story about a boy going somewhere with his grandmother after church and not feeling very enthusiastic about it. The elegance of the writing may be over my little reader's head. Though I have read that this book is for grade school age children, not three-year-olds. It's not meant for my guy, who likes looking at pictures of trucks. Though he prefers trains, to be honest. Picture books cover such an array of age groups. Someone must be writing about that, right? 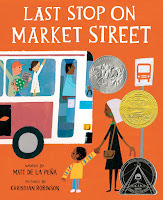 Last Stop on Market Street was this year's Newbery winner, by the way. I told you it was elegant. Also, Market Street's illustrator, Christian Robinson, also illustrated Gaston and Josephine. During Monkey Mind Summer, I am managing to keep up better with professional reading than I usually do. No, I don't know what that's about. 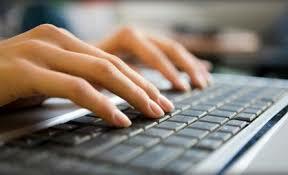 The four articles on literary agents. They make clear the value of agents and the array of things they can do. While I've known writers who didn't have these kinds of experiences with agents, this cover story describes the writer agent dream. Forget princes. "Some day my agent will come..."
How to Pitch Yourself to Bookstores: What Booksellers Want From An Author by Lynn Rosen. Oh, my gosh. 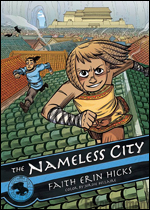 Superpowered Storytelling: What I've Learned From Writing Comics by Benjamin Percy. Favorite bits: Treating outlines like rehearsals (Remember that, Gail) and "Every story is about the thing and the other thing." 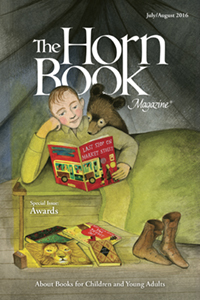 Look What The July/August Horn Book Included! 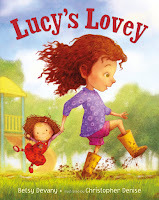 On Sunday, a family member and I were talking about how there are a lot of childlit bullying books out there. It will be hard for a self-published bullying book, or even one from a small publisher, to get much attention. "You know what I want to see?" I asked. "I want to see a bullying book from a bully's point of view. Do these people know they are bullies? Do they care?" 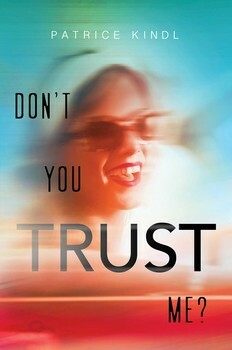 Well, the July/August Horn Book carries a review for Patrice Kindl's Don't You Trust Me? that doesn't make it sound like an actual bully book. But the reviewer does say it involves a protagonist who can "lie, cheat, and steal without sparing a thought for the impact on anyone else." The book is described as "a fast-moving tale of unapologetic self-interest." The word "amoral" is tossed in. While Don't You Trust Me? may not be the bully book I was hoping for, it sounds absolutely refreshing.